It would be much easier to understand those things, if the compiler could generate a full list of definitions and equates. In assembly, if you state #LIST, it will create a list file with everything, so you can just eyeball it and find possible problems or discrepancies from what you think must be right. Why hide those things form the user? what is the intention? GCC has almost exactly that with - fverbose-asm passed to the compiler if you elect to keep the .s files. One of my early thoughts was "Symbols" in project properties making a -DF_CPU=nnnnUL that would over-ride any subsequent #define in .h/.c files. I'd wager that source files will override "command line defines". Last one wins, right? At least it does in CodeVision. Or are you saying that every line such as #define is examined after it is carried out to see whether the result has a global override? Not the way I'd write my compiler. Last one wins is just a tradition. compilers are allowed to ignore the tradition. I know of none that do. I'd wager that source files will override "command line defines". Last one wins, right? Good question. I suppose the question is really "when an already defined warning is given does the prepro then use the existsing def or the new one"
So you are right - the last one over-rides. Bang goes that theory then! If your fuses are set in such a way so as to invoke the 1MHz internal clock of avr then F_CPU will have no effect for any integer greater than 1Mhz. I fear you misunderstand. Sure F_CPU cannot change the speed of the CPU but it sure can affect the number of delaying opcodes used when various forms of _delay_us()/_delay_ms() are then used. #define-d or command line-define-d to be the CPU frequency in Hertz. Lying is allowed, but is rarely wise. Accidental mismatches have the same effects as lying. The usual accidental mismatch involves the DIV8 fuse. _delay_ms is an actual function. is #include-d or command line-included. hence subsequent #define-s of F_CPU do not matter. OP has become quiet. Let's concentrate on solving the dozen-line program, with no redefinition. My money is that the .HEX being loaded, "identical" no matter the F_CPU value, isn't the one produced by the build of the source file. Checking that, and .LSS, and similar should be straightforward for OP given all the effort already to-date. Is OP really using VisualStudio and not AtmelStudio? It seems that we may never know. That's my bet also - - - why ? 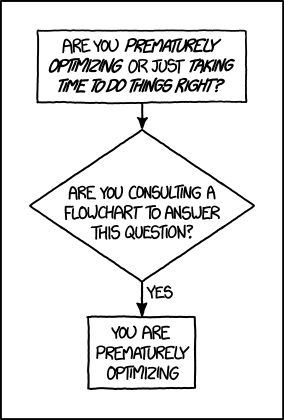 Been there ; done very similar in forgetting to actually flash program the new hex ; and not just once either. OP probably dying of embarrassment at the post count his "mistake" has generated. If a macro ceases to be useful, it may be undefined with the ‘#undef’ directive. ‘#undef’ takes a single argument, the name of the macro to undefine. You use the bare macro name, even if the macro is function-like. It is an error if anything appears on the line after the macro name. ‘#undef’ has no effect if the name is not a macro. Once a macro has been undefined, that identifier may be redefined as a macro by a subsequent ‘#define’ directive. The new definition need not have any resemblance to the old definition. Both are the same type of macro (object- or function-like). All the tokens of the replacement list are the same. If there are any parameters, they are the same. Whitespace appears in the same places in both. It need not be exactly the same amount of whitespace, though. Remember that comments count as whitespace. If a macro is redefined with a definition that is not effectively the same as the old one, the preprocessor issues a warning and changes the macro to use the new definition. If the new definition is effectively the same, the redefinition is silently ignored. This allows, for instance, two different headers to define a common macro. The preprocessor will only complain if the definitions do not match. then #define it to your desired value? changing F_CPU will not help. OP, attach or copy/paste them here, please. Thanks for the instructions but it aint working for me, any idea ? I rebuilt the short code but still no LSS file in the release folder ? Did you look in Solution Explorer > Output files > (yourprojectname).lss ?? Look in the debug folder. Again, a wild guess: Can't find .LSS, and changed builds have no effect: The output isn't where you think it is. The build log should give full file names? Do a full build, and check the date stamps on the output files? Sometimes a brute-force search of the hard drive is enlightening; e.g., "find all .LSS and .HEX files from today". Could the directory target be on a different e.g. network drive? Perhaps that secure drive is W.O.M.? Several additional cool things going on here (apart from the fact that either method confirms D:\test\test\Release as the location) and that is (a) AS7 does a very nice job of displaying hex file contents and (b) (never noticed before) there's additional data in "Properties" to show the binary size represented by the Hex contents - which is nice. Anyway like both Lee and I have said above this whole thread looks an awful lot like you are programming a different file to the one you are building. So use either of the above to identify exactly where the .HEX file is then go to your programming system and make sure that the .hex file listed there is the same thing. Strong chance it isn't. I finally decided to Clean Install AS7, no Visual-Micro no Arduino IDE. I'M up and running. I can program my ATtiny85 with my simple LED flash code. An, Yes, the F_CPU 1000000 or F_CPU 8000000 make a difference in the chip behavior, just as it should. Has the chip is Hard Burned for a default frequency of 1MHz, telling the code that F_CPU is 8MHz will make the LED flash 8 times slower. Case closed. The problem is embedded in the Arduino layer somehow. Where is the problem is the subject for a whole new research project which is not on my priority list for now. Thanks to all for your technical support. The problem is embedded in the Arduino layer somehow. I wouldn't think so, from the evidence you DID show. Why the resistance, after the many back-and-forths on this issue, to post the log of the build? To post the .LSS output file contents? Lee, he's using Visual Studio+Visual Micro, not AS7, sounds like it doesn't do LSS by default. 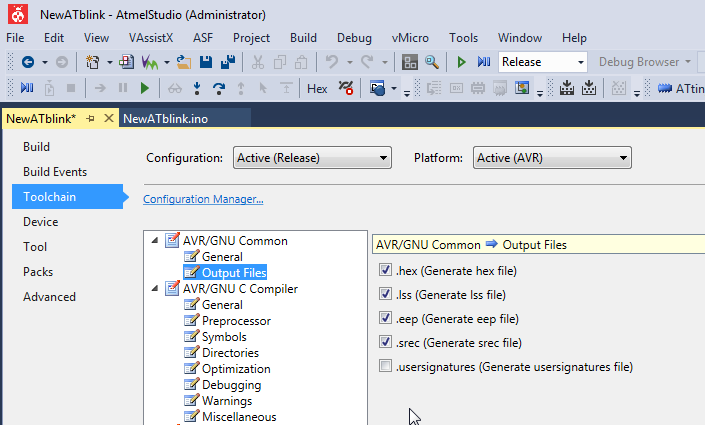 But in #68 the image shows Atmel Studio in the title bar. A red herring? The app icon upper left of the title bar tells the story? Even with the "related" installation, wouldn't the build log be shown in >>some<< pane? I could envision how the named Arduino culprit might put stuff in a different spot. But we never saw Output Files in a navigator pane? Nor a build log in any pane? I gave up trying to use the _delay_ms() command, I could never get it to work correctly on the ATtiny10. Instead I used a counter to delay the program. After reading all the comments and suggestions I finally decided to go pure AS7 with no Visual-Micro no Arduino layer. I uploaded my small code and Bang! Voila! The ATtiny85 is acting as it should. Timing behave correctly at 1MHz F_CPU and at 8MHz it goes 8 times too slow. Which is exactly what it should do. It would appear that somewhere in Visual-Micro and or Arduino IDE the is a command that does not address the F_CPU as it should, which is another subject altogether, that is not on my priority list at the moment. Thanks to all for getting involved. _delay_ms and _delay_us are just counters, nothing else. During pre processing the number of cycles to be ' burned' is calculated, like you did yourself. that is then loaded in the used registers right before the actual routine is called. Only pest that if you have a lot of interrupts running in the back ground, they will mess up your nicely calculated delay as they burn additional cycles, but you do not know how many as the interrupts are 'random' in appearance and length. hence the need to turn on optimization.